Styling creams can be tricky for afro-textured hair. They tend to be moisturizing but often lack hold, which defeats the purpose of using them. Sometimes they are only sufficient for stretched styles like twist out, braid outs, and Bantu-knot outs, but what about wash and go’s? Although EcoStyler and Wet Line Xtreme Professional Styling Gel are great, I would like a break from the gel cast. Don’t get me wrong, hold is the key to longevity for a Type 4 wash and go, but with gels I am always left wanting more moisturizing benefits. Every time I purchase a styling product, I have four requirements that cannot be compromised: moisturize, definition, soft hold, and slip. 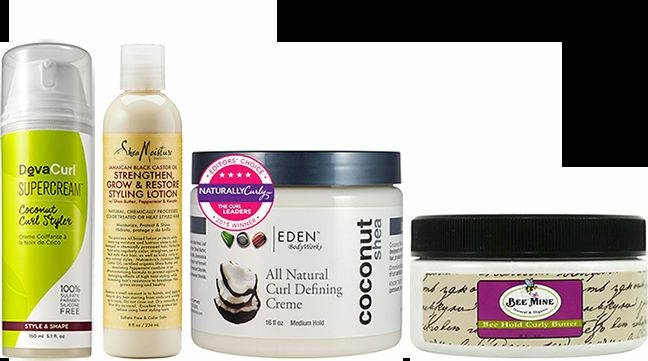 Here are my four go-to stylers that moisturize and define my coily wash and go’s. This product is a part of my Holy Grail regimen for multiple reasons. The Eden BodyWorks Coconut Shea Curl Defining Creme is chock-full with moisturizing ingredients like water, coconut oil, aloe vera leaf juice, avocado oil, and glycerin. In addition to being moisturizing, the cetyl alcohol (fatty alcohol), stearyl alcohol (fatty alcohol), jojoba oil, cetrimonium chloride, and benzyl alcohol give this product supreme slip that prevents my hair from tangling and dragging during the application process. Being able to shingle the product thoroughly is essential for reducing frizz and avoiding breakage. The hold is not too strong to where your hair looks and feels stiff, but it is strong enough to maintain definition for up to seven days. Lastly, the price to quantity ratio is amazing. 16 oz. for $8.99? This is an all-around five star product. The DevaCurl Supercream is amazing. Its moisturizing properties can be credited to water, coconut oil, glycerin, panthenol, and propylene glycol. Again, like every styler on this list, the slip from the cetearyl alcohol (fatty alcohol), cetrimonium chloride, and behentrimonium chloride allows my fingers to glide through with no snags. With this product there is no need to worry about Ramen noodle, crunchy hair. Moisture=5, Definition=4, Soft hold=5, and Slip=5. This product is similar to a pudding. Its simple ingredients consist of shea butter, aloe vera gel, essential oil blend, vegetable glycerin, rosemary leaf and chamomile extract and silk powder. That’s all. Bee Mine Curly Butter provides great definition and is extremely moisturizing. This product pairs well with the Bee Mine Luscious Balanced Moisturizer and Bee Mine Deja’s Hair Milk. Overall this Moisture=5, Definition=4, Soft hold=5, and Slip=4. The SheaMoisture Jamaican Black Castor Oil Styling Lotion has the strongest hold of the four products listed. It also has the thickest consistency, which helps to elongate your curly clusters. Not only is a great for wash and go’s, but I have had much success using it as a heat protectant during the blow-dry process before flat ironing. This product pairs well with the SheaMoisture Jamaican Black Castor Oil Leave-in Conditioner for twice the amount of moisture and strength. If you need a little protein boost, then the hydrolyzed vegetable protein, hydrolyzed keratin, and hydrolyzed silk will do the trick. Moisture=4, Definition=5, Soft hold=3, and Slip=4. All of these stylers are applied on freshly washed, soaking wet hair with a leave-in conditioner (not all at once). In order to maintain my curl definition, I skip the blow-dry, diffusing process and opt to air-dry all day. When my hair is 80% dry I shake it out to add body at the roots. At night I use the modified pineapple method to maintain my hair overnight. What are your favorite styling creams for your wash and go?